Do you remember Quincy Conference, an educational conference held for thirty years where up to 3,000 educators visited Quincy to engage in professional development and the sharing of innovative ideas? 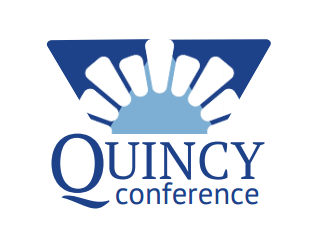 We are excited to announce that Quincy Conference is back! Adams County Academic Success Initiative (ACASI), Regional Office of Education 1 (ROE 1), and Quincy Public Schools (QPS) have partnered to revitalize Quincy Conference and are currently making plans for Quincy Conference 2019: Innovate to Great, which will be held October 10th and October 11th, 2019. The revival of this conference will provide regional, state, and national educators the opportunity to engage in high-quality professional development and networking. Last year’s conference welcomed more than 2,200 attendees and we are anticipating more than 2,500 attendees this year. Thursday, October 10th and Friday, October 11th will be conference days with well-known featured speakers and engaging breakout sessions. We need your organization/company’s support to help make this conference a success. 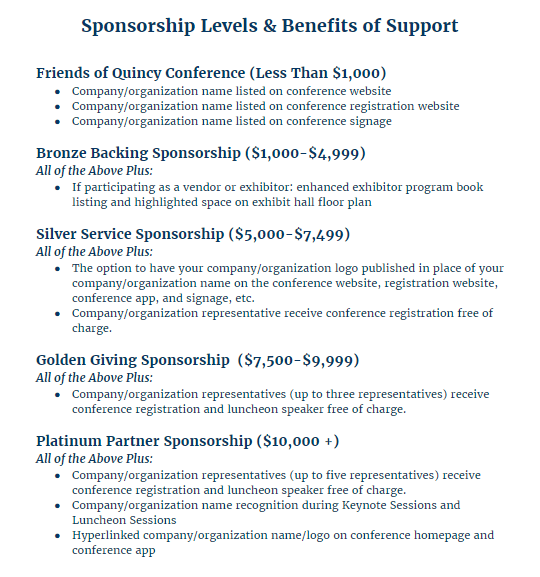 If your organization/company is interested in supporting Quincy Conference 2019, please complete the above form. We are accepting monetary donations, as well as a product or a service. Any donation will be greatly appreciated. If you have any questions or concerns, please feel free to contact us at qcyconference@gmail.com or call Airen O'Cheltree or Michaela Fray at 217-277-2080. We appreciate your interest and willingness to sponsor Quincy Conference 2019.